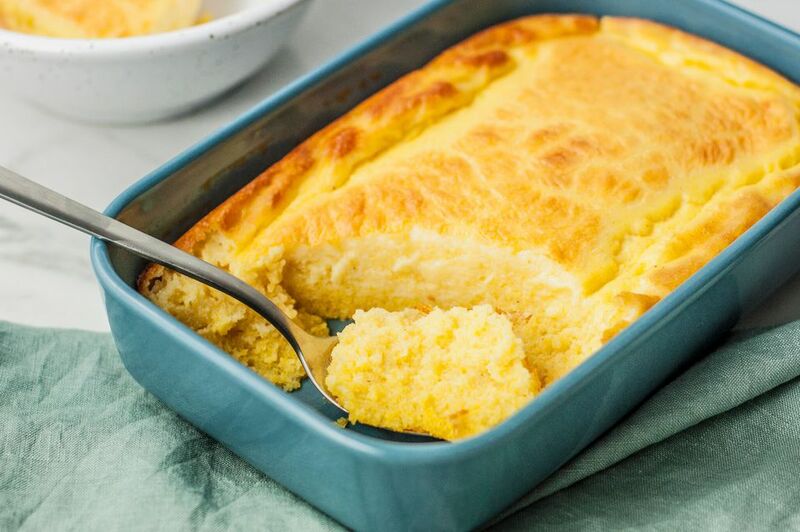 Spoonbread is a custard-like cornbread you scoop with a spoon. It's thought to be of Native American origin, and it became popular around the turn of the century. According to the Encyclopedia of American Food and Drink, the term was first used in print in 1847. This is a simple recipe, but feel free add some crumbled bacon or corn kernels to the batter, or add chopped green onions or some fresh chopped chile pepper or herbs. Grease an 8-inch square baking dish or 1 1/2-quart casserole. Combine cornmeal and salt in a mixing bowl (do not add the baking powder until step 7). Gradually add the boiling water while whisking out any lumps. Add the melted butter and stir to blend. Let the mixture cool for about 5 minutes. Whisk the milk into the cornmeal mixture. In a small bowl, beat the eggs thoroughly. Whisk the beaten eggs into the cornmeal mixture along with baking powder. Blend well with a whisk or electric mixer. Turn the batter into the prepared baking dish. Bake for about 35 minutes, or until set and lightly browned. Serve the spoon bread hot with plenty of butter. Add about 2 cups of cooked to roasted corn kernels to the spoonbread batter.